In the 1980s, when I was in grade school, my parents gave me my first portable cassette player. On it, I listened to Alvin and the Chipmunks and Beethoven. When I was 10, I received my first pop music cassette tape as a birthday gift from a friend. By then, the cassette player had been upgraded to a shock-resistance one with stereo sound features. Yet for a teenager craving pop music, even cassette tapes were a luxury. 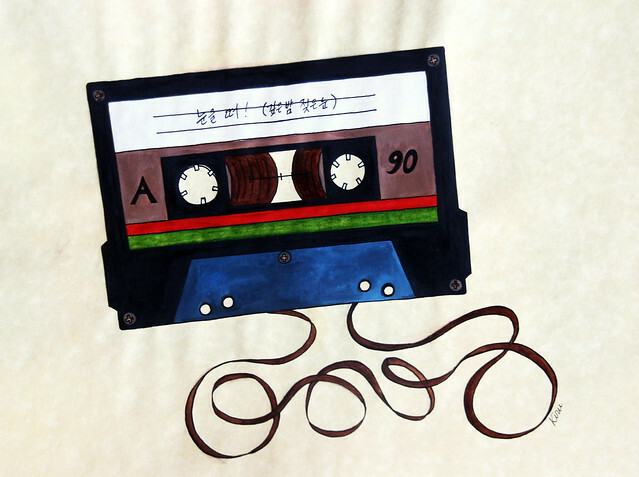 Every weekend, I listened to “Top 50 Pop Songs” on the radio and recorded the songs onto a 120 minute blank tape. This compilation tape was then “dubbed” onto other blanks and passed on to my friends. In high school, about a third of the kids in my class carried CD players and the rest still used cassette players. We spent evenings browsing record stores- which were carrying cassettes, CDs, and LPs. We began noticing that since CDs did not have two sides, musicians stopped dividing their album into two parts. It wasn’t until the late 90s that I was able to buy a CD without starving for a week. I had an obsession for CD collecting in my college years. Mp3s were all the rage- with people sharing them over P2P programs- but only popular music was to be found through those networks. Music such as industrial, Brit pop, electronika, and global music could only be found in record stores. By this time, record stores were carrying little or no cassette tapes. Somewhere in between (I forget when) I got an MD player, but was unable to find MDs (or the few MDs there were were so expensive) so this player quickly became useless. By the time I graduated college, the industry was rapidly changing. One by one, record stores closed down, including Tower Records. It was because of the Internet. Not only because people were sharing music files, but also because they were buying music online. At first people were buying CDs online, but then the physical product itself disappeared and music was downloaded in a digital format. For 20 years, music was limited to under 70 minutes (mostly under 60). The first MP3 player I received (in 2000) could store hours of music. It was 256 mega bytes and cost 300 dollars. A year afterwards, 1G players cost 200 dollars. Now, I can get a 160G for that much money. That is more music than I have time to listen to.